Things that make me go GAH! 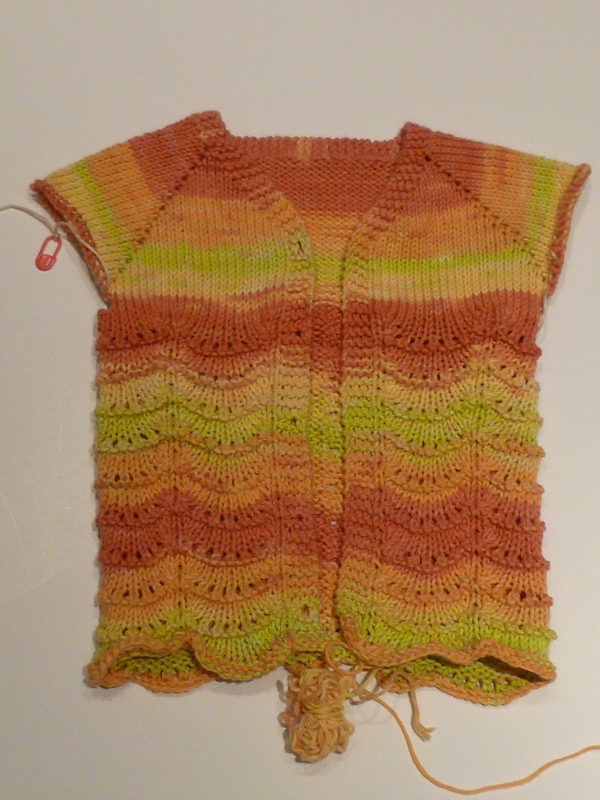 I finished the body of the Scalloped Lace Baby Cardigan the other day. 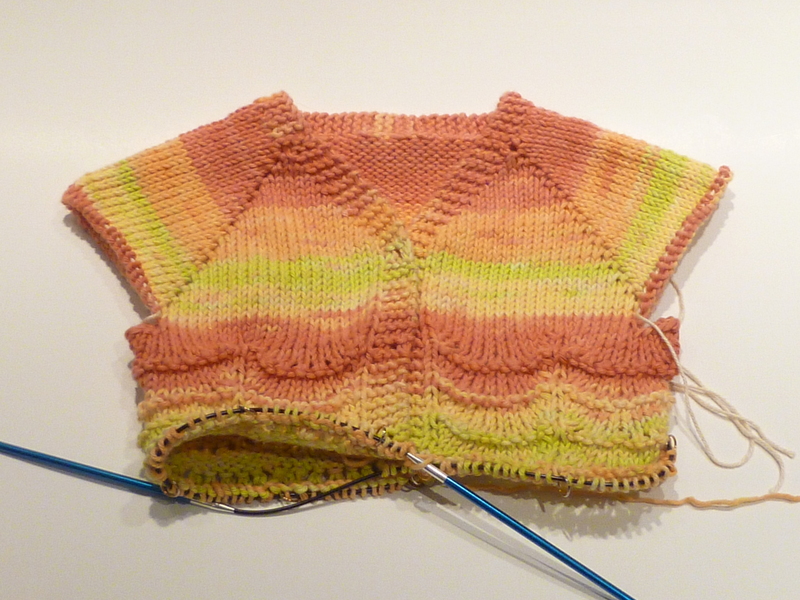 I wanted to block the body to double-check my post-blocking gauge before I knit the sleeves, so I set it aside for a moment and started another baby cardigan. In the time since I cast on for the first cardigan, another baby made his (early!) 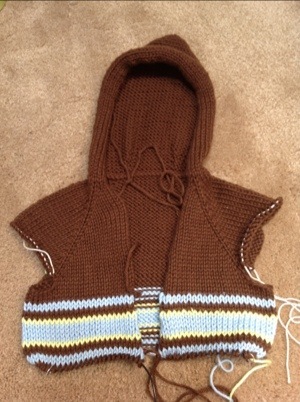 appearance into this world, which meant that I needed to get cracking on the little hoodie I’d planned for him. I picked the lace cardigan yesterday and noticed a big goof. Can you find it? Gah. I hate that. I spent so much time looking at this, but somehow didn’t see anything wrong. I already frogged the buttonband on the buttonhole side once after I realized that somehow I didn’t space the buttonholes evenly. Frogging stitches at the edge of the work is a royal pain (and a really good argument for picking up stitches and knitting the buttonbands after the fact— which is incidentally what I decided to do with the hoodie sweater!). Wish I’d goofed on the row below, because then I could have just sewn the button over it and ignored it! If you have other suggestions, please post them in the comments. This is a gift for my son’s teacher, and the school year is rapidly drawing to a close, so I am running out of time! I sat down on Mother’s Day, determined to work on the Stripe Study Shawl. I had purchased a raspberry-colored skein of absolutely gorgeous merino/silk laceweight at MDSW several years ago from The Flock Bransonas. (Sadly, they were not at MDSW this year, and they do not seem to have a website.) I had no project in mind when I purchased it; it was a total impulse buy. I later found some equally gorgeous yarn in a charcoal gray (from the Neighborhood Fiber Co.) that went beautifully with the raspberry yarn; it seemed to be begging to become a Stripe Study Shawl. 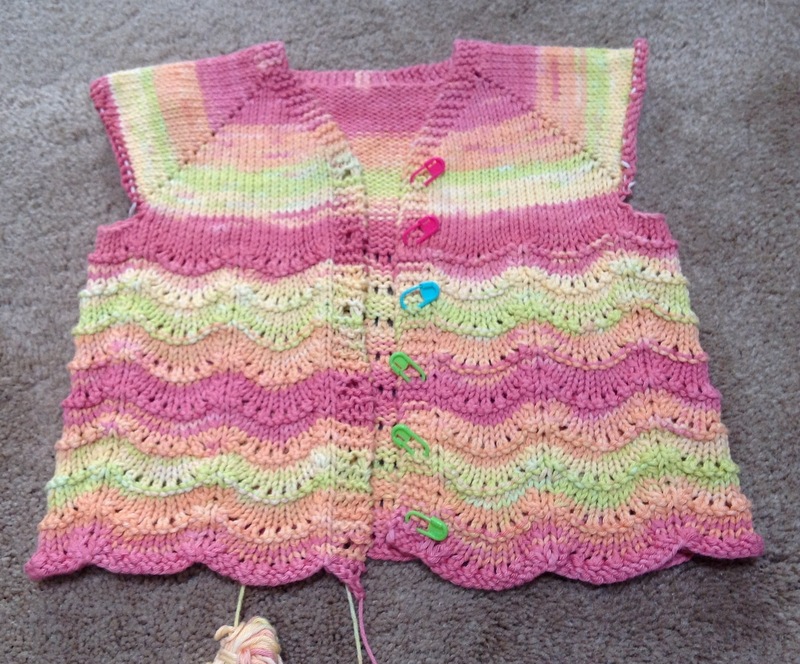 I have this feeling that knitting on Mother’s Day should be somewhat selfish in nature— in other words, not baby gift knitting!— so the Stripe Study seemed like the perfect project. 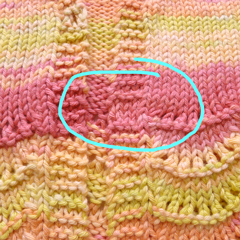 I read through a lot of the comments on Ravelry, and found that people were running out of the stripe color before the border color. I have almost twice as much gray yarn as pink yarn, so it made sense for me to cast on again, this time starting with pink. 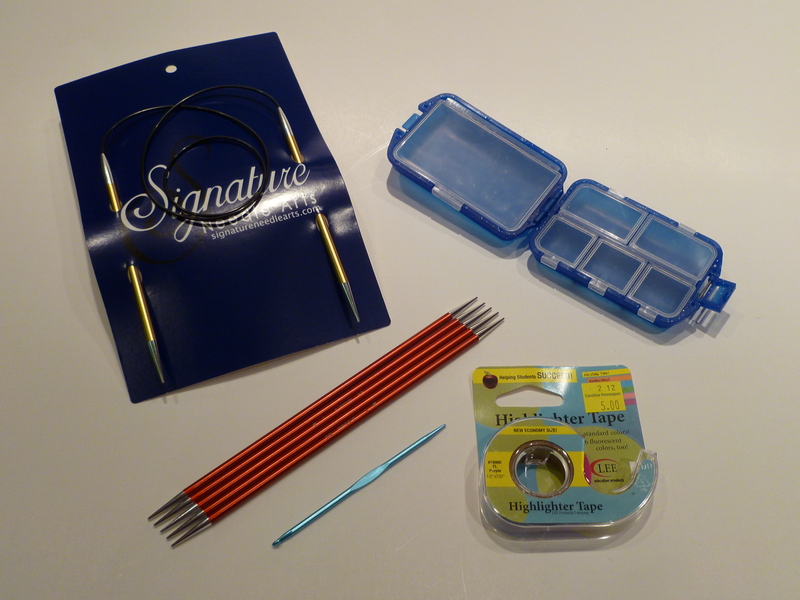 So I did, still using the size 4 needles (which looked fine with the gray yarn). 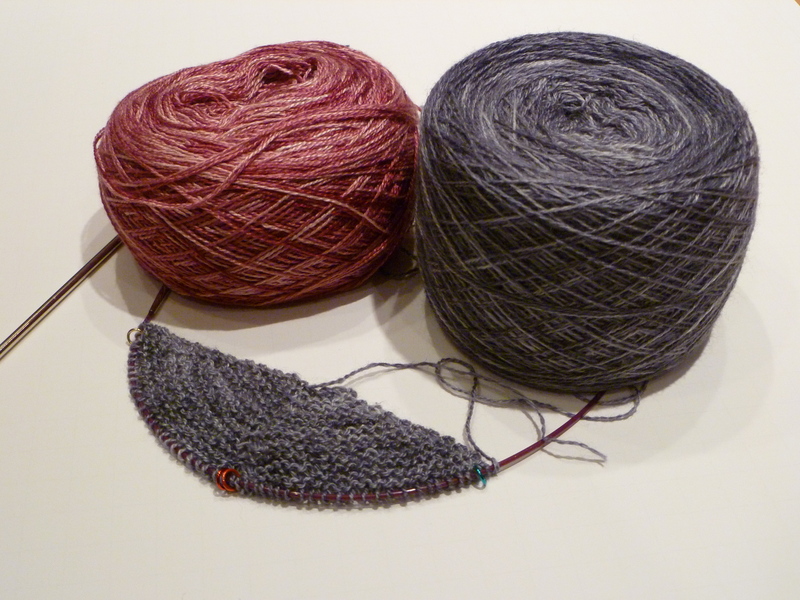 Even though both yarns are laceweight, the pink is clearly finer than the gray yarn. It did not look nice a springy in garter stitch; it looked rather stretched out and sloppy. 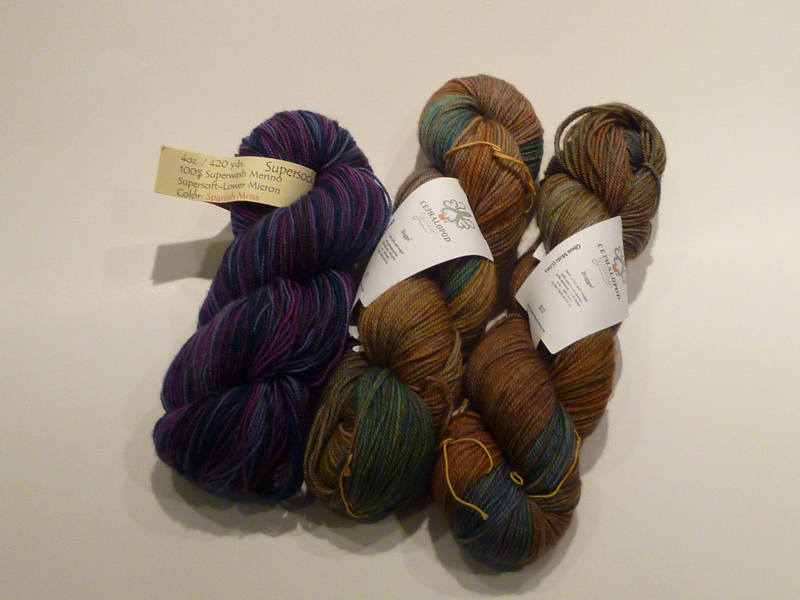 So I went down to the size 2.5 needles (3mm) that she suggested for the laceweight version of the Color Affection shawl. That looked a little bit better but… well, it’s tough on my eyes and seems like a LOT of knitting for very little gain. I knit socks on size 1 needles without a hitch, and I don’t think I’d mind knitting lace patterns out of laceweight yarn, but garter stitch is supposed to be easy tv-watching knitting, and in laceweight, for me at least, it’s not. Now I’m mulling over the idea of knitting the Stripe Study in stockinette instead of garter stitch. I don’t mind purling, and I find the German short row method (which I normally use with stockinette) to be faster and less fiddly than wrapping-and-turning (which I use with garter stitch). Hmmmmmmm. So that left me without a “selfish knitting project” on Mother’s Day, and a whole afternoon out on the patio with perfect weather to fill. 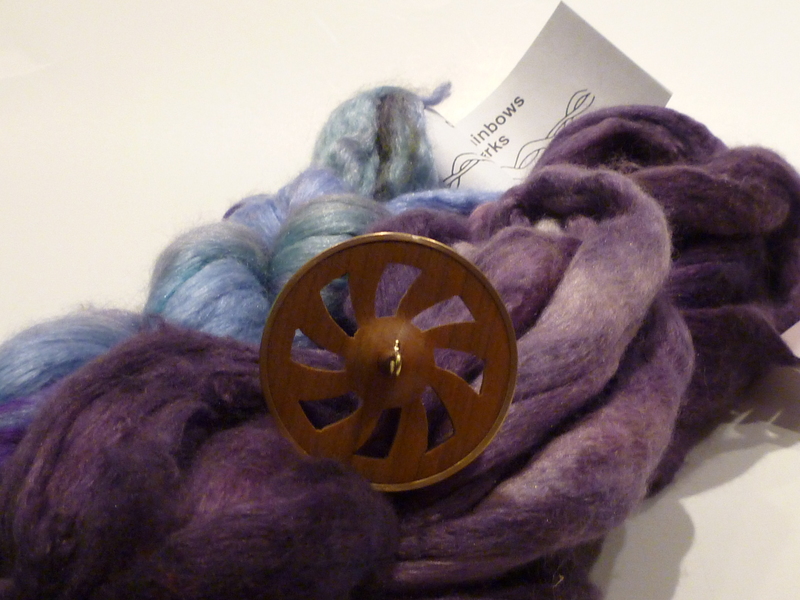 I pulled out my new Golding spindle and decided to spin a bit while I mulled over the shawl situation. 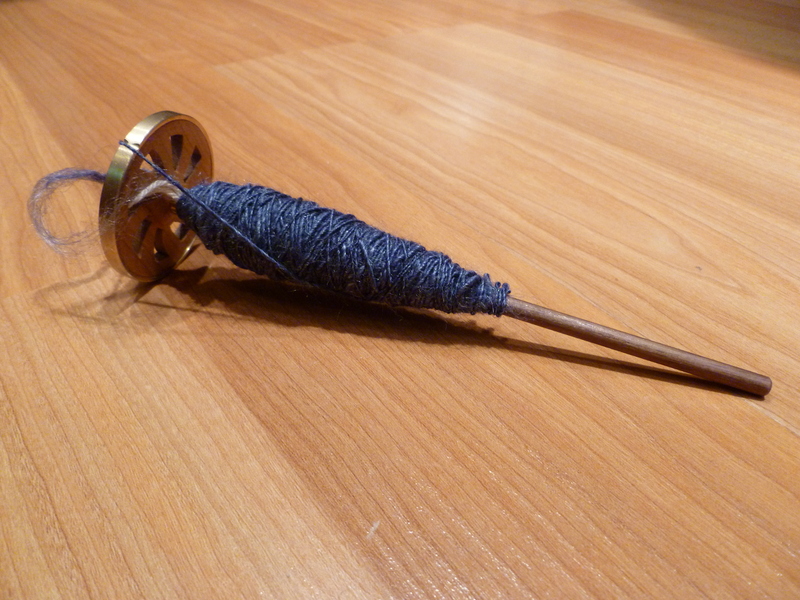 I’m using the heavier Turkish spindle to ply the two together. I’m about halfway through the plying. 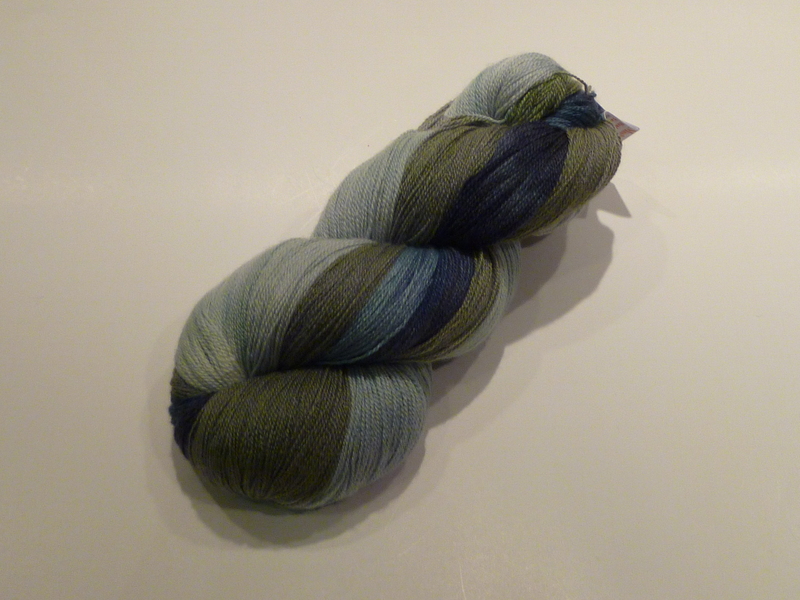 And my new Niddy Noddy just arrived, so as soon as I’m done with the plying, I can skein the whole thing, give it a nice, long soak, and have actual yarn that I can knit with. Yay! A few years ago, I stumbled across a pretty green and red garnet necklace at a craft fair. I hadn’t seen green garnets before, and the whole combination just screamed my mother’s name at me. Her favorite color is green, and she wears a lot of shades of green, brown, rust, and brick reds, so the colors in the necklace would go with at least half of her wardrobe. I scooped it up and gave it to her for Mother’s Day. She loved it. She loved it so much, she asked if I could find out who made it and see if I could get earrings to match it. Easier said than done. 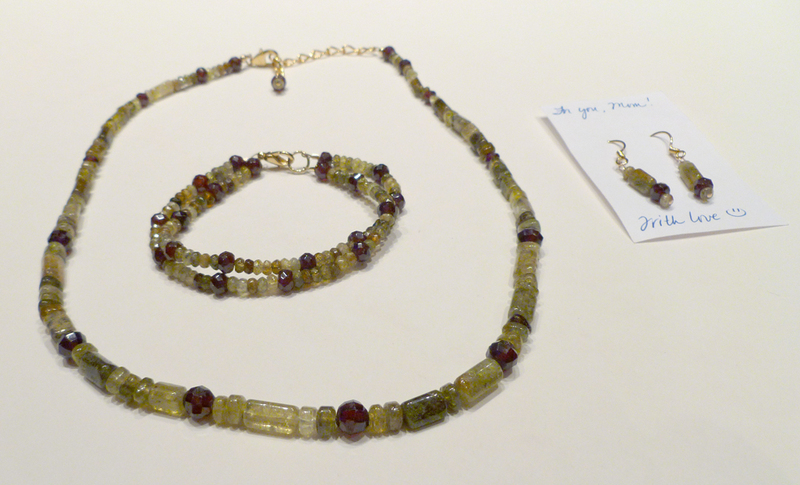 I did finally manage to track down the person who’d made the necklace, but she didn’t have any more green garnets. 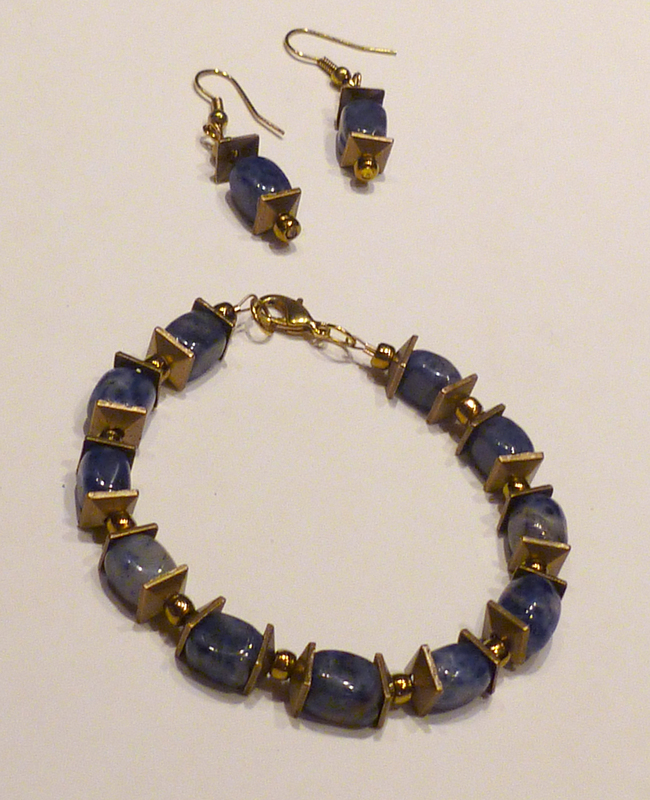 She had some other stones that were a similar color, but they were a different shape. 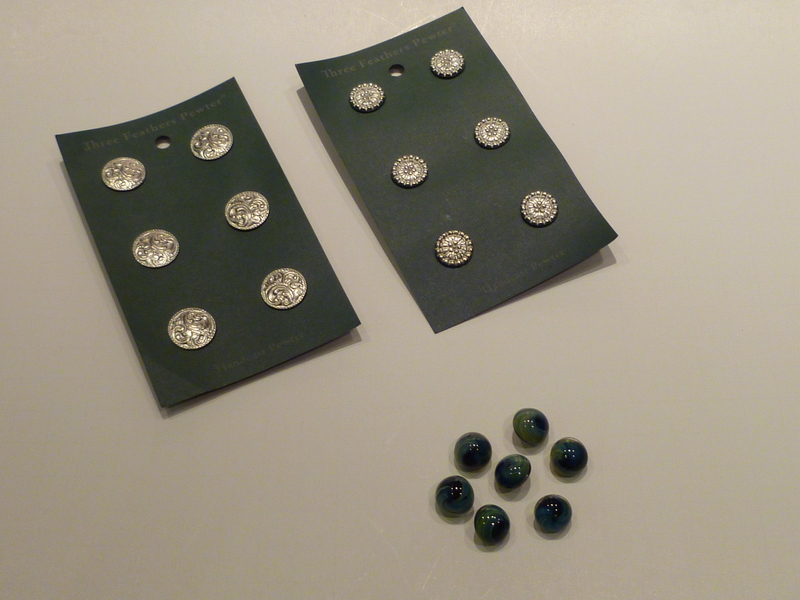 I decided that I was going to have to hunt down some green garnets myself. I found some at a bead shop near my house. They were slightly smaller than the ones used in my mom’s necklace, but the color matched perfectly, and I was able to find some matching red garnet beads as well. My mom didn’t like the clasp that had been used to secure the necklace, so I figured I could restring the necklace, replace the clasp, and while I was at it, I could substitute some of the new (slightly smaller) beads for two of the larger beads, which I could then combine with some of the new red and green garnet beads to make earrings. I had to purchase a string of each color of the garnets, so I had plenty of stones left over to make a matching double-stranded bracelet as well. So I finished the set up and gave it to my mom while she was visiting this past weekend. She was tickled. And as long as I had all my jewelry-making supplies out, I made a few more stitch markers. These were just simple silver jump rings with a seed bead glued over the seam of the jump ring, so there’s nothing to catch on your yarn. Nothing too fancy and quick and easy to make. 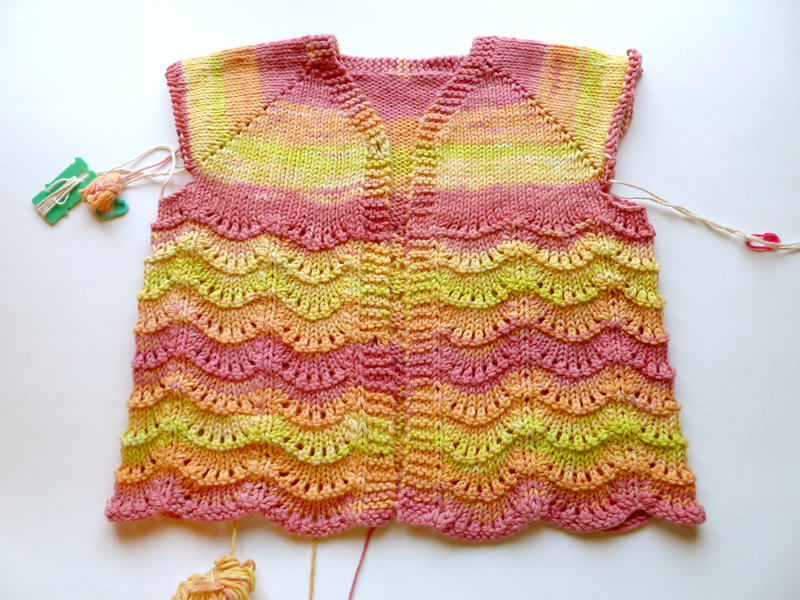 They’ve already been put to use on the Scalloped Lace Baby Sweater! Today is Mother’s Day here in the US, so I just wanted to wish all the moms out there a very happy Mother’s Day! I’m starting my day off with going out to brunch with my family (which is far and away my absolute favorite meal to go out for!). My son has a soccer game in the afternoon, but after that, I will be relaxing with my family— and, yes, there will be knitting. Of course! If you’re a mom, I hope your day is filled with special treats, too! And even if you’re not, I hope your day is still filled with yarny goodness! I seem to be in a bit of a knitting funk. Not that I’m not knitting; I am. But I’m having a bit of trouble getting something accomplished! After I put the green sweater in time out, I turned my attention back to the baby sweater. I had figured out what I’d done wrong on the yoke of the green sweater, so I fixed my calculations for the baby sweater and went on my merry away, carrying it around with me and knitting whenever I got a chance. Unfortunately, I kind of ignored the little voice in the back of my head that say, “Hmmm. Doesn’t that look a little bit small to you?” No, I knew my math was right! So I kept on knitting. Yesterday, I bound off the bottom, laid it out and thought, “That really looks small.” So I (finally!) got out my measuring tape, and lo and behold, each repeat is almost 1/4″ more narrow than my gauge swatch, which means that over 8 repeats… it’s waaay too narrow. Arrrrrrrrgh. So today I will rip this back to the underarms and begin on row 5 of the lace repeat (the increase row), which will give me 11 lace repeats instead of 8. And then I will reknit the entire lace portion. Yes, there will be beer and/or wine involved. And once I’m done this sweater, I am going to knit shawls, because they always fit fine. My parents in crime from last year, Carla and Hope, will be joining me again, and I think I’m looking forward to the girl time as much as the yarny goodness. Carla’s coming down tonight, and we’ll meet Robin at the fairgrounds bright and early tomorrow morning. 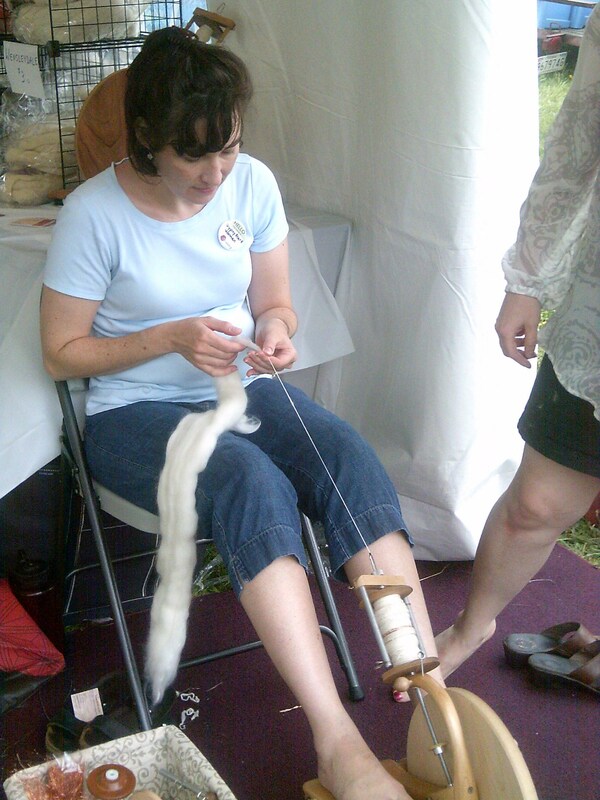 Plus, there will be yummy gyros, men in kilts, loads of adorable sheep and alpacas to pet, and lots and lots of fellow knitters. What’s not to love?! I hope your weekend is full of yarny goodness, too!